NEW YORK, January 30, 2019, /3BL Media/ — The journey for a company to deliver a long-term plan to institutional investors just became clearer with the release of a new white paper by CECP’s Strategic Investor Initiative (SII). The paper, Method of Production of Long-Term Plans, offers a behind-the-scenes look at why the CEOs of some of the world’s largest companies delivered long-term plan presentations to investors, what inputs they considered in creating the presentations, and who was involved and how the internal teams aligned and prioritized data. Launched in 2017, SII’s CEO Investor Forums are the global platform for CEOs to outline how their companies create long-term value to an audience of institutional investors that regularly represents more than $25 trillion in assets under management. The study is the latest research in the emerging practice of promoting “long-termism” - the creation of multi-year plans – usually 3-7 years – that include financial and environmental, social, and governance (ESG) factors. In a recently published study – The Economic Significance of Long-Term Plans - co-authors Tomlinson and George Serafeim, Harvard Business School and KKS advisors found that the presentation of these plans can move markets. After analyzing the stock market’s response, the data analysis showed early evidence of an abnormal change in market returns and an increase in trade volume is observed after that company’s CEO presented a long-term plan to institutional investors. 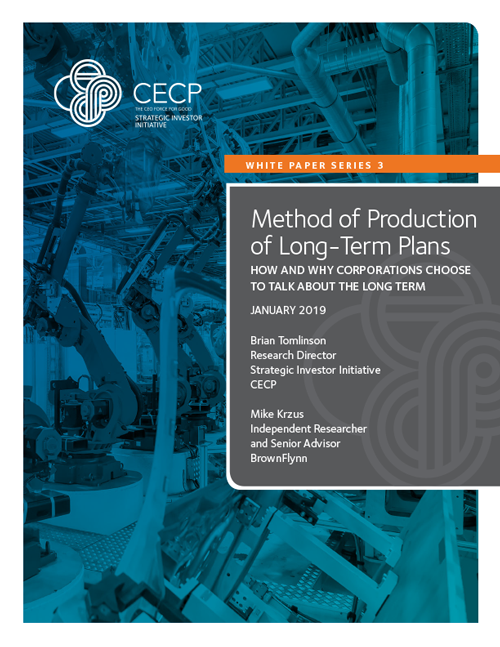 In addition, SII has published an Emerging Practice in Long-Term Plans white paper that focused on the key themes CEOs touch upon in their long-term plan presentations. “Through our research, we now know what CEOs should include in long-term plans, why they should present them, how their teams should create the plans, and that ultimately in delivering quality long-term plans to investors, CEOs can move markets,” stated Tomlinson. The sixth CEO Investor Forum will take place on February 25, 2019, in New York City. The Forum will feature long-term plan presentations from Steven Collis, Chairman, President & CEO, AmerisourceBergen Corporation; Kevin P. Clark, President & CEO, APTIV PLC; Robin Hayes, CEO, JetBlue, Mark Schneider, CEO, Nestlé; and Peter Van Camp, Executive Chairman, Equinix. In addition, there will be a kickoff luncheon panel focusing on megatrends in business featuring Johnson & Johnson CEO and Co-Chair of SII Alex Gorsky, and Former Chairman of Vanguard Bill McNabb along with Mark T. Bertolini, Former Chairman and Chief Executive Officer, Aetna Inc.; Barbara Humpton, US CEO, Siemens Corporation; and Omar Ishrak, CEO, Medtronic. More information about the Strategic Investor Initiative’s research, the CEO Investor Forums, and the movement to promote long-termism on Wall Street can be found at: http://cecp.co/SII. CECP is a CEO-led coalition that believes that a company’s social strategy — how it engages with key stakeholders including employees, communities, investors, and customers —determines company success. Founded in 1999 by actor and philanthropist Paul Newman and other business leaders to create a better world through business, CECP has grown to a movement of more than 200 of the world’s largest companies that represent $11.3 trillion in revenues, $23.8 billion in societal investment, 17.4 million employees, and $15 trillion in assets under management. CECP helps companies transform their social strategy by providing customized connections and networking, counsel and support, benchmarking and trends, and awareness building and recognition. The Strategic Investor Initiative is a coalition of thought leaders committed to the long-term movement. Collectively, SII is developing a new platform for leading companies to create, convey, and deliver long-term plans to long-term investors. SII’s vision is to spark the movement of trillions of dollars of capital to companies demonstrating performance excellence over the long-term. SII provides tools and resources designed to introduce and support market behaviors that ultimately deliver sustained long-term value for all stakeholders.